Featuring the art work of some of the best bird artists in the United States. Welcome to Birdzilla.com's Bird Artist Colony. We really enjoy art focused on birds. In this section, we'll be featuring some of the top bird artisits in the country. Bird paintings can be both inspired and inspiring. Both bird paintings and bird illustrations are used in bird guides. The bird paintings and bird illustrations by John James Audubon are perhaps the most famous. John Gould is sometimes referred to as the British Audubon. His paintings of birds are outstanding. 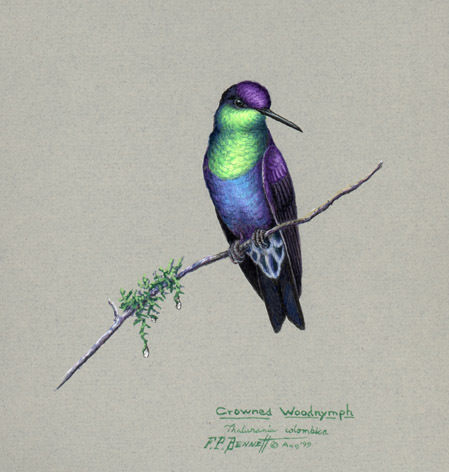 Perhaps his best known bird illustrations are of hummingbirds. The large plates often used a thin layer of gold on the gorget (throat) of the males hummingbirds. The gold was then overlaid with various colors of enamel to produce the brilliant colors flashed by hummingbirds. Click on the name of a more current bird artist on the left to enjoy their work. The beautiful Crowned Woodnymph (featured below) is a species of hummingbird in the Trochilidae family. It has a wide distribution and is found in Argentina, Bolivia, Brazil, Colombia, Ecuador, French Guiana, Guyana, Paraguay, Peru, Suriname, Trinidad and Tobago, and Venezuela. It is found in subtropical or tropical moist lowland forests, subtropical or tropical moist montane forests, and even in heavily degraded former forest. It has been known by several different names and has not been well-studied by scientists. Visit Carly Brooke's web site to see some beautiful photographs of this beautiful hummingbird. If selected, we'll place from one to ten samples of your art work on the site, along with your biography and a link to your web site or other contact information. Roger Tory Peterson. Famous for the bird illustrations in the Peterson Bird Guide Series. David Sibley: Famous for the bird paintings in his suburb field guides. George Miksch Sutton: Famous as an ornithologist, writer and artist. Alexander Wilson: Famous ornithologist, naturalist and for his bird paintings and illustrations.